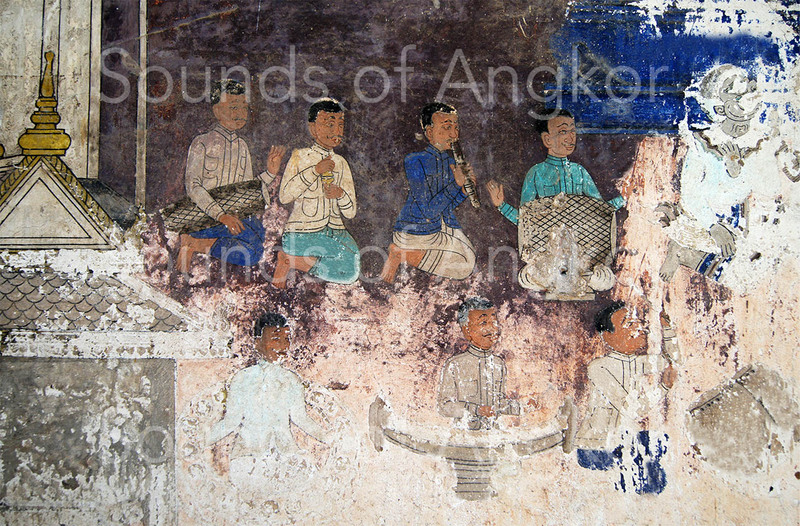 The Reamker and its musical iconography - Site de soundsofangkor ! 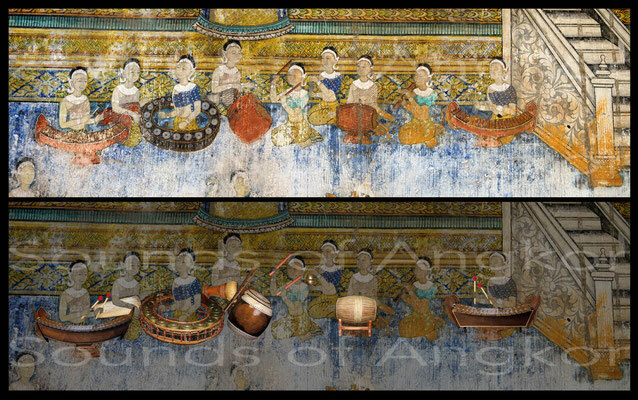 Here we explore Angkorian and post-Angkorian iconography featuring musical instruments in scenes illustrating the Reamker. Several Angkorian temples offer us an iconography in which musical instruments are staged: Baphuon, Angkor Wat, Banteay Samrè, Wat Baset (today at the Musée Guimet - Paris). It consists exclusively of martial orchestras composed of drums, horns, conches and cymbals. 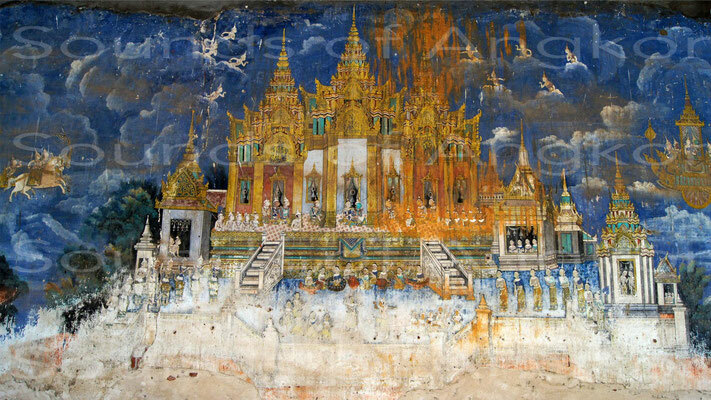 The most prestigious scenes are in Angkor Wat in the Northwest Pavilion (musicians of Hanuman's army) and in the west gallery, North Wing (Battle of Langka). Post-Angkor iconography, too, has adapted its instruments to the fashion of each era. For example, the large fresco of the Silver Pagoda at the Royal Palace in Phnom Penh depicts two palatine orchestras of the early 20th century: phleng siam (pin peat) and phleng kar (wedding band). We make here a presentation at the same time thematic and chronological. 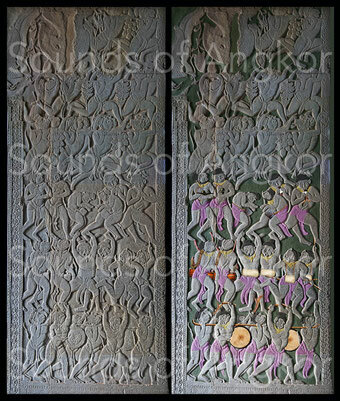 The iconography of the Baphuon is almost entirely devoted to the Reamker, but musical instruments are rare. Only two scenes show drums. On the other hand, it is the first appearance of a ‘large shoulder carried drum’. On the other hand, we don't know if it is a barrel drum or a frame drum because it is presented, here and in all Angkorian iconography, from the front. This type of big drum is widely quoted in the various versions of the Reamker. On two of the scenes, we can also see short and long cylindrical drums. 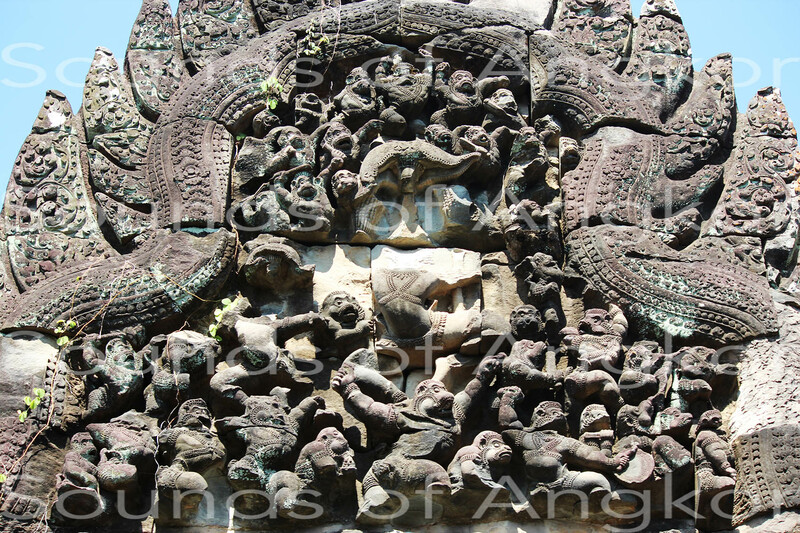 This lintel comes from Wat Baset, a temple in the Battambang region. It is dated 11th-12th centuries. It is now visible at the Musée Guimet in Paris (ref MG18218). He depicts several scenes: the alliance of Sugrîb with Ream and Laks, the fight of the two monkey brothers Sugrîb and Bâlî and death of the latter. 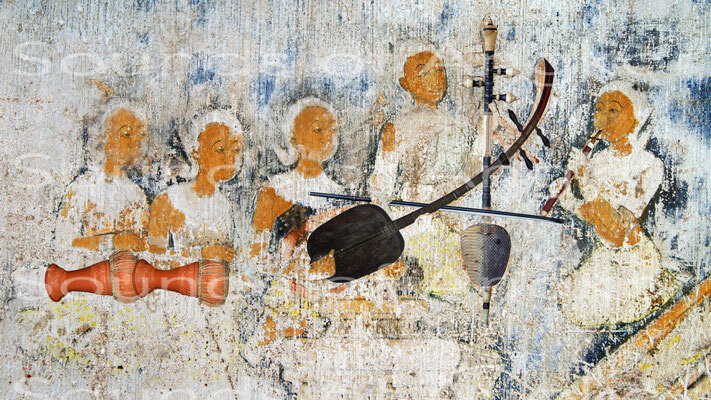 At the top of the general scene we can see two musical monkeys and three instruments. 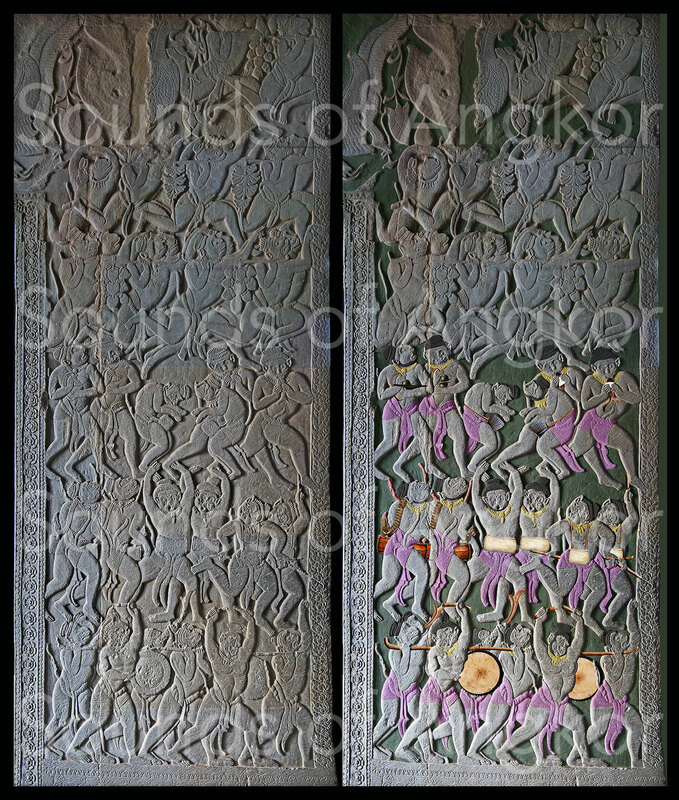 It is a unique case in all Angkorian iconography to see a character playing two instruments simultaneously. On the left, there is a goblet drum with its device for tensioning the skin by lacing. On the right, a cylindrical drum struck with a wand and a trumpet with a makara mouthpiece. 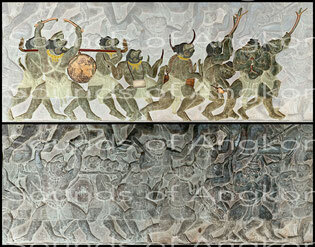 This scene belongs to the great bas-relief of the Battle of Langka of the west gallery, north wing, of Angkor Wat. The musicians are the monkeys of Hanuman's army thrown by Prince Ream to deliver Seda owned by Reap, King of Langka. From right to left, we can see a pair of horns, a conch, a goblet drum, an hourglass drum with its carrying bow in the form of two crossed nagas, a small cylindrical drum and a ‘large shoulder carried drum’. The horns, conches and drums of wars are widely quoted in the various versions of the Reamker. 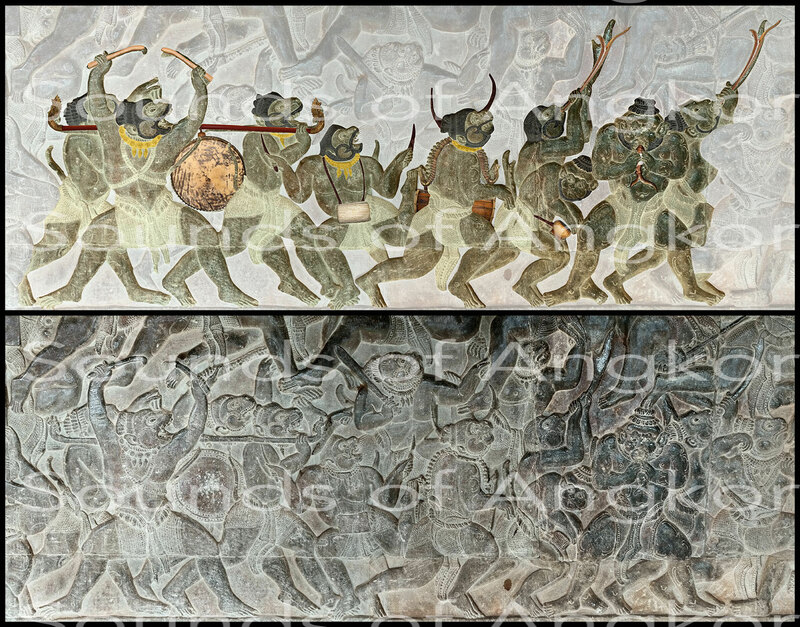 This scene, like the previous one, belongs to the great bas-relief of the Langka Battle of Angkor Wat. 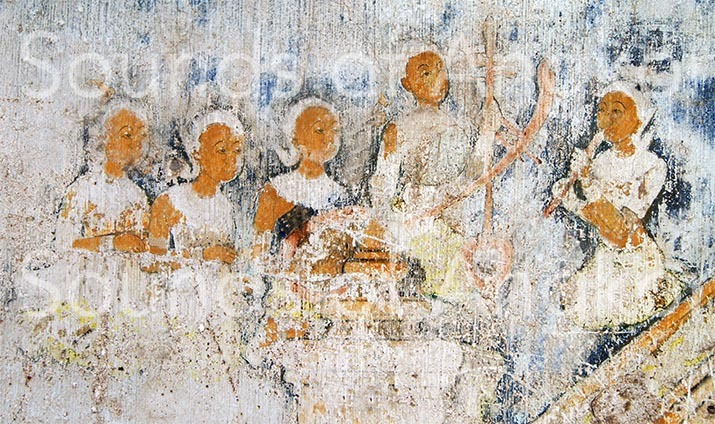 Its composition is unique in all Angkorian iconography. 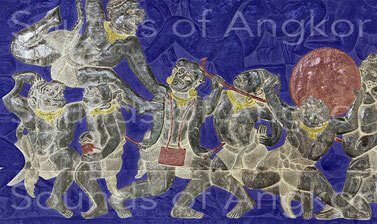 Here, the musicians of the king of Langka, Reap, are attacked by the monkeys of Hanuman's army. From left to right, there is a goblet drum, a small cylindrical drum and a large drum. What makes the scene unique? 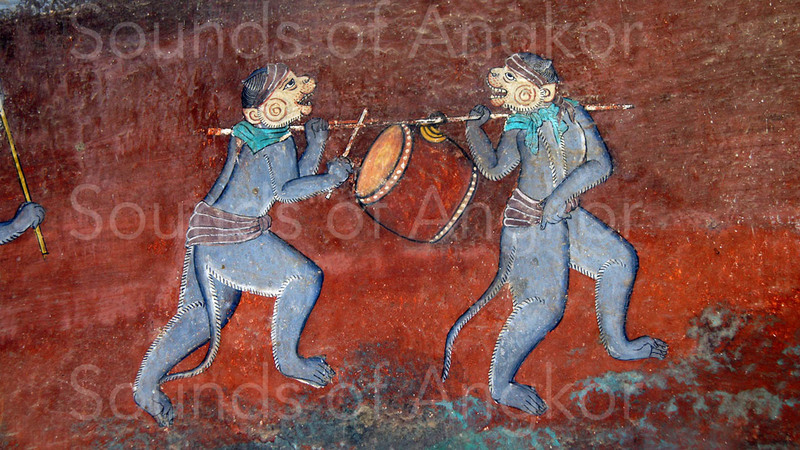 Look at the monkey on the right side: it grasps the big drum with his right hand to throw it in the air while its left hand grabs the hair of the drum-carrier. As for the two musicians on the left, they are also savagely attacked by monkeys. 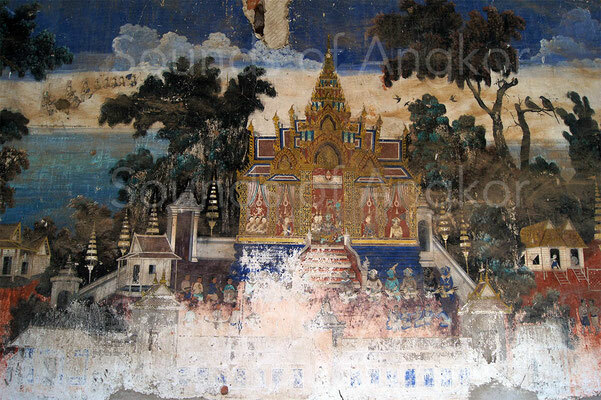 This scene is located in the northwest corner pavilion of Angkor Wat. It is the richest in martial instruments and corroborates all the instrumental organology visible in Angkorian temples with such an iconography. It should be read from bottom to top and from right to left. This is one of the few scenes where two large drums are shown together. Others are visible in the north gallery of this same temple. They are carried by two monkeys while two drummers strike vehemently. Behind them are two horn players. Above, two small cylindrical drums struck with sticks followed by two long cylindrical drums struck with bare hands and two hourglass drums carried with a naga-crisscrossed-shaped's arch. The two snakeheads and the two tails are clearly visible above the musicians' heads. The arches are equipped with three rows of bells. At the third level, two conch players, two goblet drummers held between the legs and two cymbalists. We will notice the staging of hourglass drummers facing each other. Above the musicians is the war logistics with coconut and banana bearers. 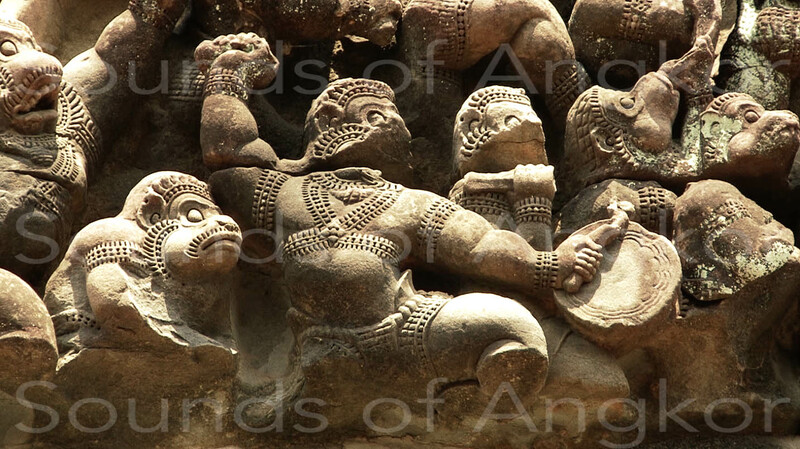 A pediment of the Banteay Samrè temple shows a battle scene accompanied by an orchestra of which only a few things remain. In the lower right, a tambourine monkey strikes a large drum whose skin is decorated. We recognize behind his left arm the posterior carrier. Under his right arm, another drummer whose instrument has disappeared. Above the big drum, a trumpet player. The most beautiful frescoes of the Reamker are those of the silver pagoda in Phnom Penh, within the walls of the Royal Palace, painted between 1898 and 1903 by order of King Norodom and under the direction of the Okhna Tepnimit Mak, one the best masters of the Khmer pictorial tradition. 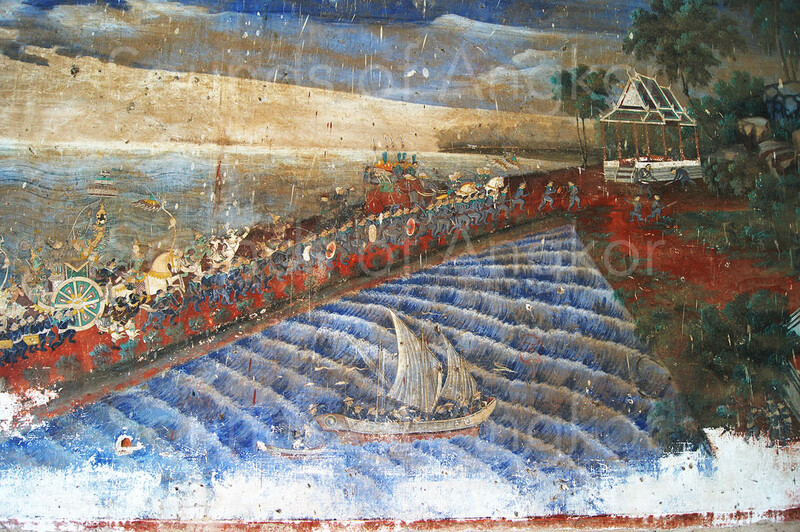 One of the scenes depicts the crossing of the inland channel separating southern India from Langka Island. We can see here two monkeys carrying a barrel drum struck by the posterior carriers. A very beautiful scene, unfortunately today very damaged by the humidity, puts in scene two orchestras. She portrays Isur proceeding to the marriage of Ream and Seda on Mount Kailash. In this unusual wedding ceremony, there is a phleng Siam orchestra (a name used at the time for the pin peat) played by women and a phleng kar orchestra (now called phleng kar boran) also in the hands of the women. The orchestra consists of a lute (chapei dang veng) whose sound box is not visible, a fiddle (tro Khmer) and two drums (skor daey). It is interesting to note that the pin peat ensemble is both cited in the text and accompanies Sbek Thom's representations. This scene depicts a phleng Siam orchestra (as it was called in the early 20th century) or pin peat. 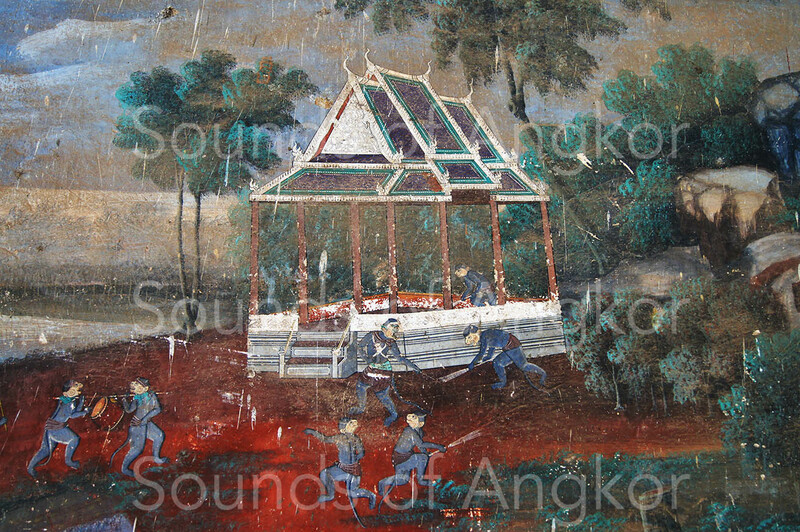 In the lower left corner, there is a gong chime (kong vong thom), then a xylophone (roneat aek) and a pair of big drums (skor thom). At the top left, a cylindrical drum (skor sang na), a pair of small cymbals (chhing), an oboe (sralai) and finally a barrel drum (skor samphor).